What happens when the phone rings? Email is still the best form of marketing. It’s cheap, direct and it works because largely, it’s permission-based; the people on your email list have given you the go-ahead to send them messages. But most estate and letting agents are simply blasting their lists with their latest listings. That’s not marketing; that’s ‘broadcasting’. And anyway, isn’t it vendors and landlords that you want? So why treat everyone like a buyer or tenant? If you’re emailing out newsletters each month or so, you’re also missing a trick. Newsletters are all about you, and they want to know what’s in it for them. Think about your own burgeoning email inbox; the average person gets 147 emails a day. You may get even more. So what makes you click on a certain email and ignore others? If you saw the word ‘newsletter’ in the subject line, would it rouse your curiosity? Or would you pass over it in favour of more juicy and compelling emails? Some of my clients are using email marketing so well, they get all their new business that way. So instead of having to do leaflet drops, touting letters and expensive advertising, they focus on building up their email list, adding new, motivated vendors and landlords each day through clever online and offline marketing activities. Email can be automated, so you can set up a series of emails to be delivered in a particular order over a set period of time, and the automation does the hard work for you, leaving you free to do what you do best – listing and selling or renting properties. I recently checked the original source of my last 100 new clients, and discovered that over 90% of them had come from my email list. 1. Focus on building a list of motivated, quality vendors and landlords. 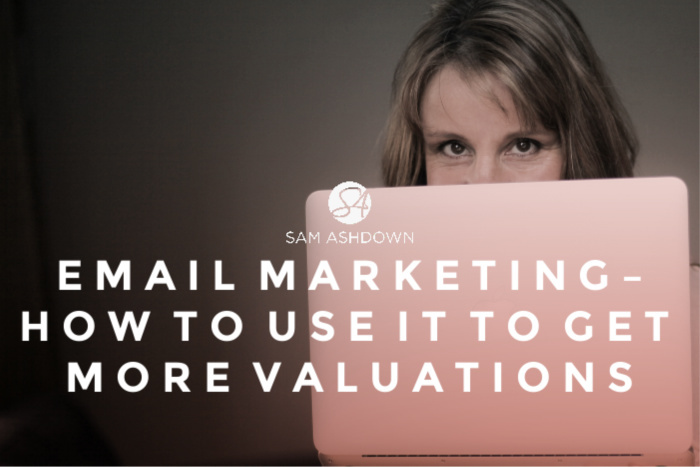 Use Facebook Ads, social media, blogging, leaflets and any of your regular marketing channels to drive traffic to an email capture, rather than trying to jump the gun and go straight for the valuation. 2. Create a lead nurture sequence you can automate, so that your email subscribers stay warm, interested and engaged. Write emails that are full of tips and advice, and stay away from trying to sell them anything. 3. Keep your email subscribers separate from your CRM – don’t try to use Vebra, Jupix or whatever CRM you’re using, to communicate and convert your subscribers. Instead, use a dedicated email marketing service, like Aweber, Mailchimp or Infusionsoft. 4. Mine your database regularly – your existing database – that is, all your past vendors, landlords and applicants – can be a real treasure trove of new leads. Instead of cold-calling them all, and ‘prospecting’ to them, take a smarter approach: email them asking if they would like something of value, e.g. an ebook, checklist or other informative, helpful piece of content that not only will tempt them to click to get it, it will also tell you something about them. For example, offering your entire database a checklist called ’17 Steps You Need to Take Before You Put Your Home on The Market’, means that anyone who chooses to download it is probably considering selling relatively soon. No need to segment your database, the checklist does the work for you. 5. Encourage engagement at each step – the purpose of your email marketing is to provoke a response from the recipient. A response can lead to an email conversation, which in turn can lead to a phone conversation, and then it’s only a very small step to be invited out. So ask questions that have easy answers; offer multiple-choice questions; ask for help and feedback. Any email that can generate a reply from someone on your email list is working for you, so copy the formula into other emails. Just don’t overdo it – you don’t need a question in each email. If you’re interested to know how email marketing can help to get you through more doors in your area, I offer a handful of 20 minute calls each week, for free. To claim yours, just answer a few questions here and we’ll get your call booked in asap. Speak to Sam: If you’d like to know how I think you could improve your marketing, just answer a few short questions here and I’ll tell you if and how you could be more effective.